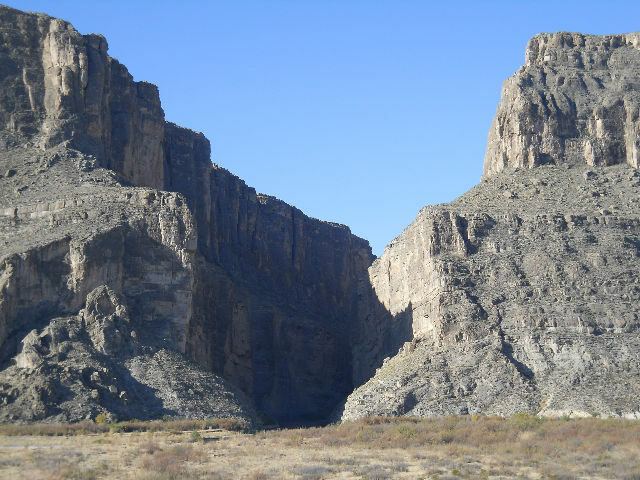 The last time we were in Big Bend National Park was in 1999, our first big trip after becoming RV'ers. 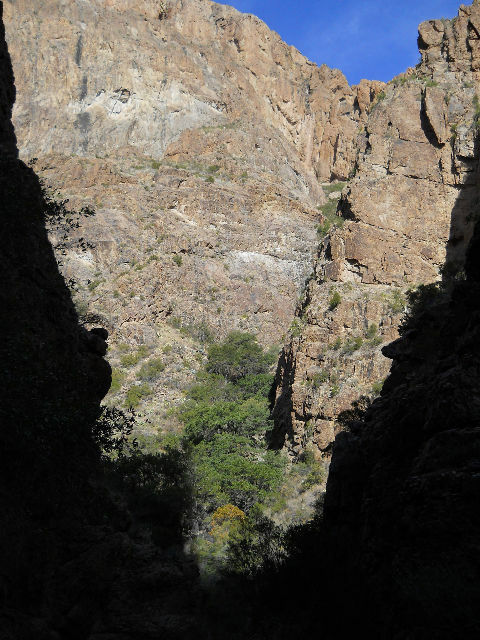 We were only there for 2 nights in the Chisos Basin Campground then. This time we wanted to really get the feel of the park, so we planned to stay 8 nights. 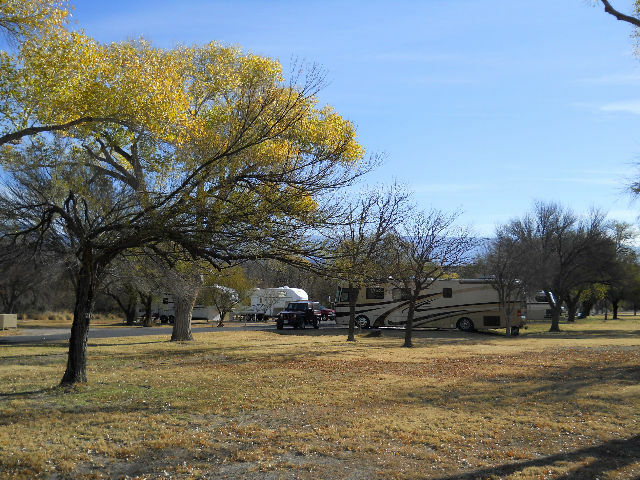 We stayed 2 nights in the Cottonwood Campground and 6 nights in the Rio Grande Village Campground. 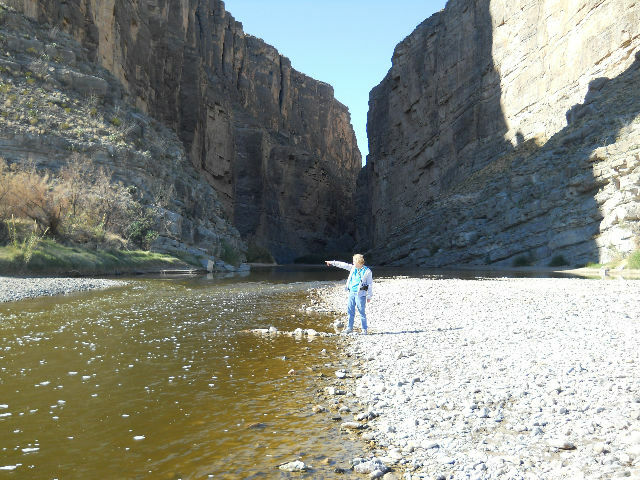 We chose a Winter trip because we wanted to stay near the Rio Grande, and in the Summer months the temperature is 110 degrees in the daytime. The Winter weather was cold at night and mild in the daytime - perfect hiking weather. This was our first use of our Honda generator to allow us to dry camp those 8 night. It worked good. We stayed busy visiting as many of the sites as we could, but the size of the park is much too large to see in one trip. We hope you enjoy our story and pictures as much as we did taking them. [Wednesday] December 29th we left Richmond about 9:30 am as a rain storm was moving in from the southwest. We got a little wet with the final loading, but were able to get away before the big rain moved in. We went up TX-99 to IH-10, then west toward San Antonio. We got out of the rain around Sealy, and as we went through San Antonio, the sky cleared and the sun shown brightly. We stopped for our first night out at Quail Springs RV in Uvalde. This is a nice park focused on Winter Texans. Unfortunately they did not have Wi-Fi :-(. [Thursday] We left Uvalde about 9:30 am and stopped in Del Rio for gasoline at Walmart and continued across Lake Amistad past all the Winter Texan RV parks lining the lake. 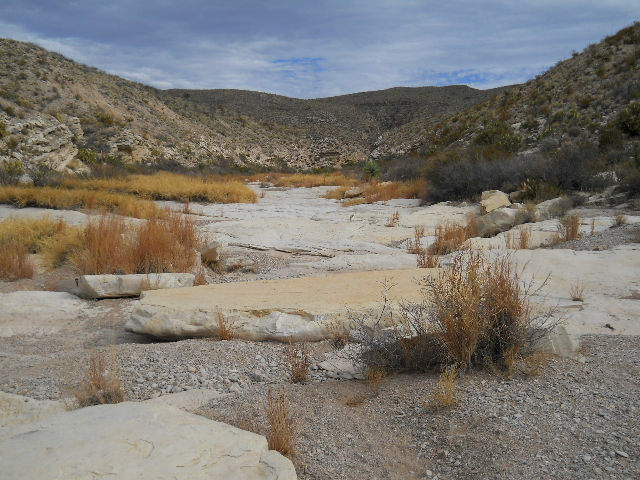 Before you get to Langtree you cross the Pecos River which appears very large because it is on the upper portion of the lake. There are nice overlooks. 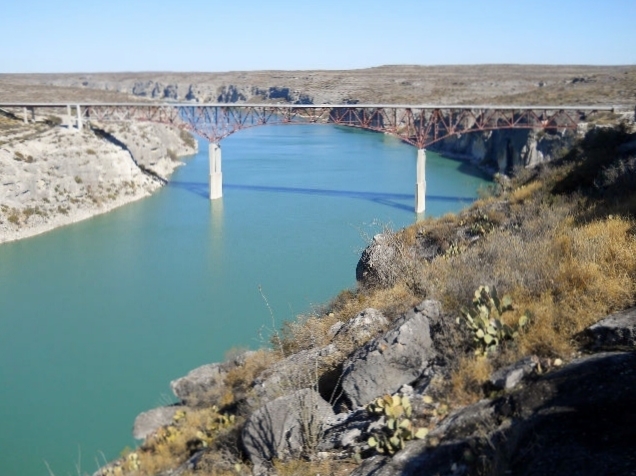 < The Pecos River bridge. We stopped for lunch in Langtree at the Roy Bean Museum and Texas Welcome Center. We didn't go to the museum, although it is a very nice free center, because we didn't really have the time and still reach Marithon before dark. We ran into a terrific 30-40 mph crosswind from the southwest all the way from Langtree to Marithon. It was exhausting driving. We stopped at the Marithon Motel and RV Park. This is a nice RV park and the Motel was recently restored and looks more like a Bed and Breakfast than a motel. The wind was still blowing very strong there and kept the trailer rocking until it finally stopped around 11 pm. 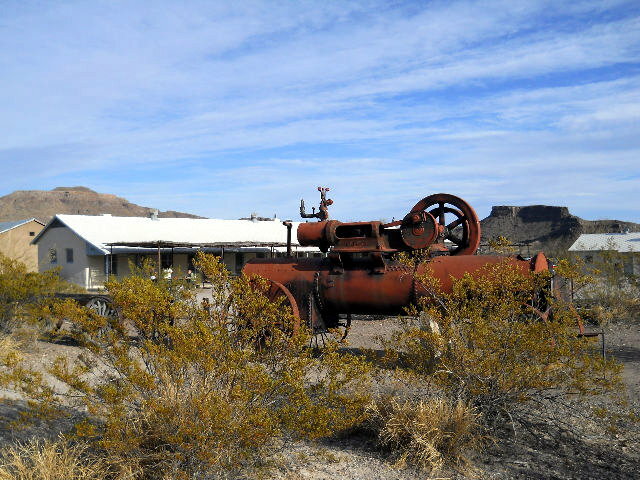 < Marithon Motel & RV Park. 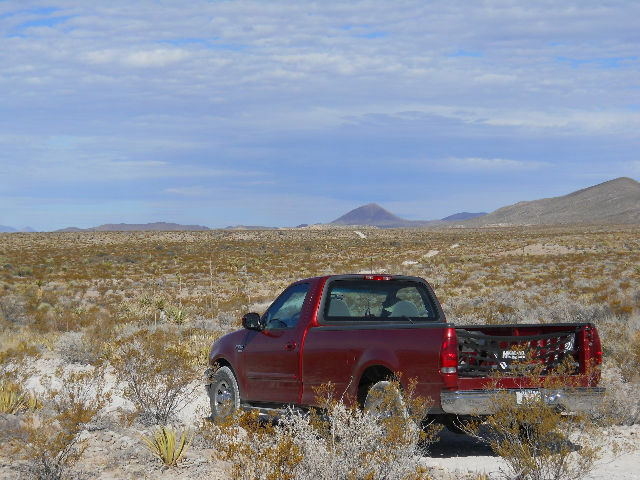 [Friday] The last day in 2010 we left Marithon around 9 am and traveled down US-385 toward Big Bend NP. We arrived at the Panther Junction Visitor Center just before lunch. We visited the center, picking up the park hikers guide and then ate lunch in the parking lot. We drove the Ross Maxwell Scenic Drive to Castolon and the Cottonwood Campground where we settled into site #3. After getting situated, we drove back up Ross Maxwell to several of the overviews. The road goes through an impressive area of white tuff beds that look like mounds of snow against the dark background boulders. At Tuff Canyon we hiked the short walk into the Canyon. 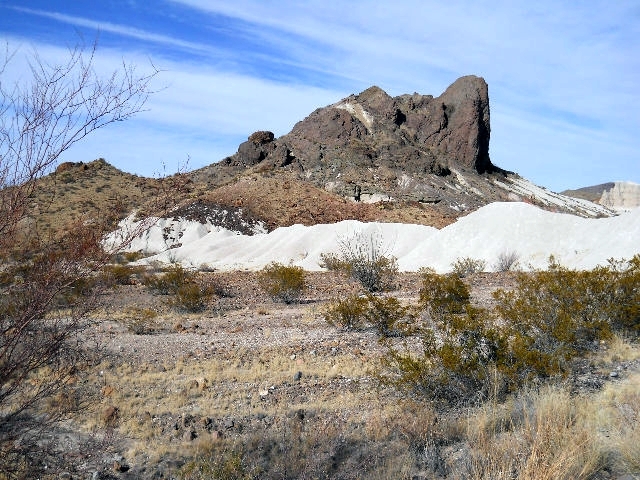 Blue Creek has cut a narrow canyon in the soft, gray rock called tuff, which is compressed volcanic ash. We stopped at the Castolon Store/Visitor Center on the way back. Back in the trailer, we enjoyed pan-fried fish for supper. < Site #3 at Cottonwood. < White tuff beds and black, basaltic boulders. 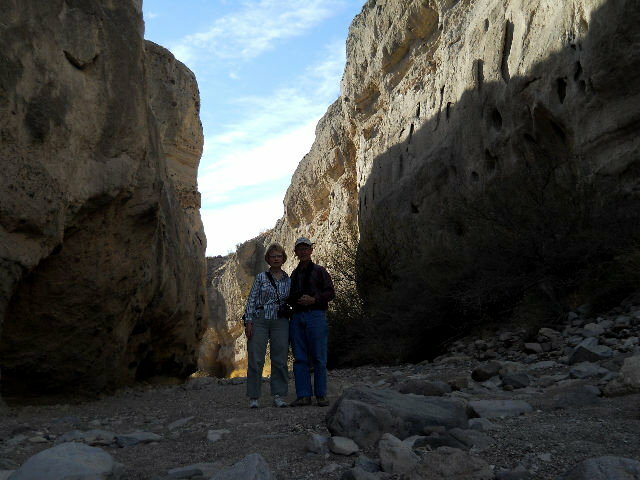 < Kay and Lawson in Tuff Canyon. 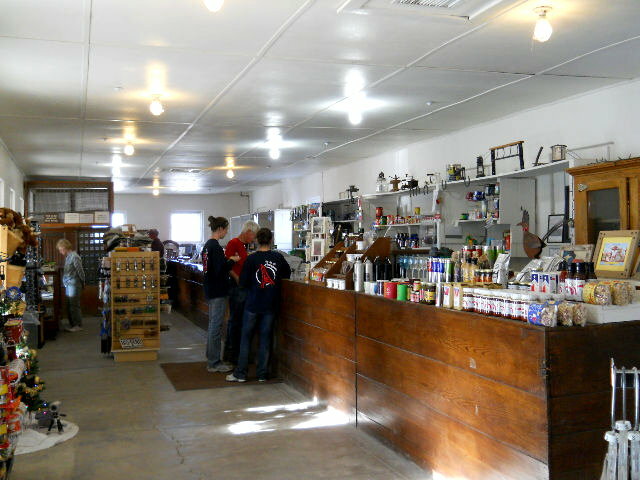 < Castolon Visitor Center and store. < Santa Elena Canyon from the overlook. < Inside the canyon. < Lawson & Kay in the canyon. < Kay points to the short, shallow wade to Mexico. 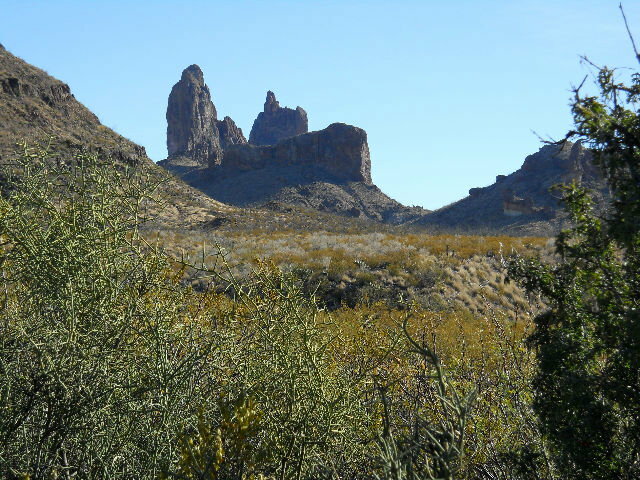 In the afternoon, we drove a few miles up the Ross Maxwell to Mule Ears Viewpoint parking. 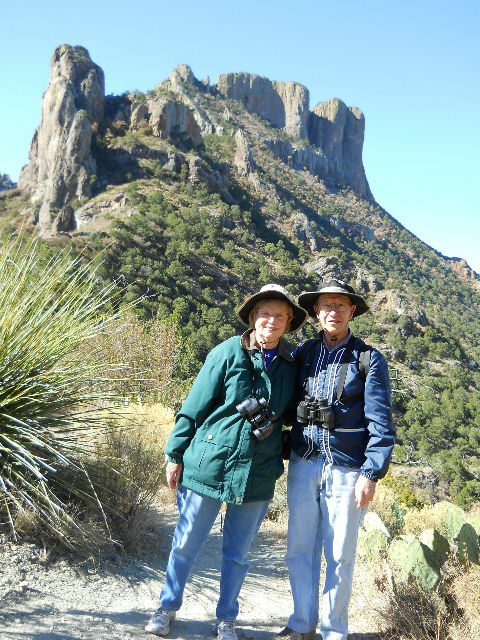 We hiked the Mule Ears Trail along the south slope of Trap Mountain to Mule Ears Spring. The trail is 3.8 miles round trip and is a fairly easy trail considering the country. 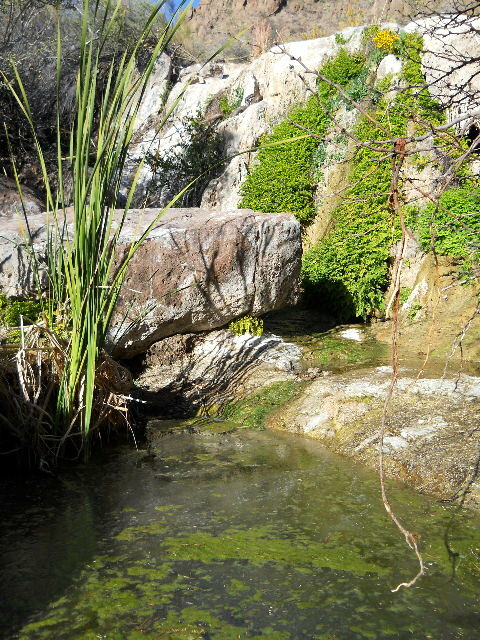 The spring is a real oasis in the desert. There were frogs and other water inhabitants in the small pocket of water coming from the spring. There was no other water for miles around unless it rains. They had not gotten rain since September and here we were in January. 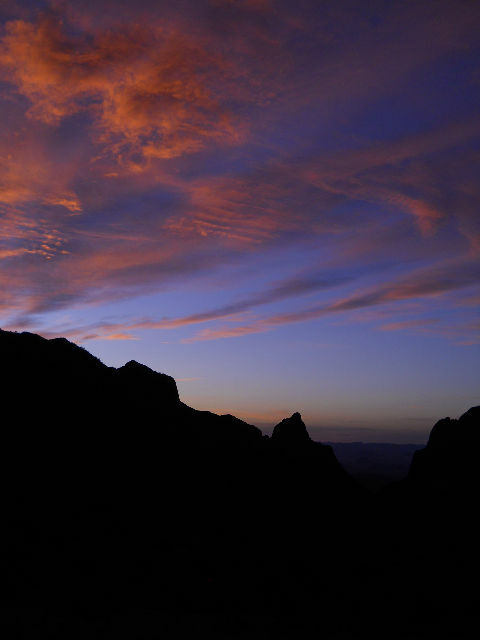 < Mule Ears Peaks. < Mule Ears Springs. [Sunday] We were getting low on our trailer battery because there are NO hookups in the campground and you can't use generators in Cottonwood Campground, so we had dry camped for 2 nights. We drove from Castolon to Rio Grande Village Campground. You are allowed to use your generator between 8 am and 8 pm in that campground. Along the way back up the Ross Maxwell Scenic Drive, we stopped many times for pictures another hike. 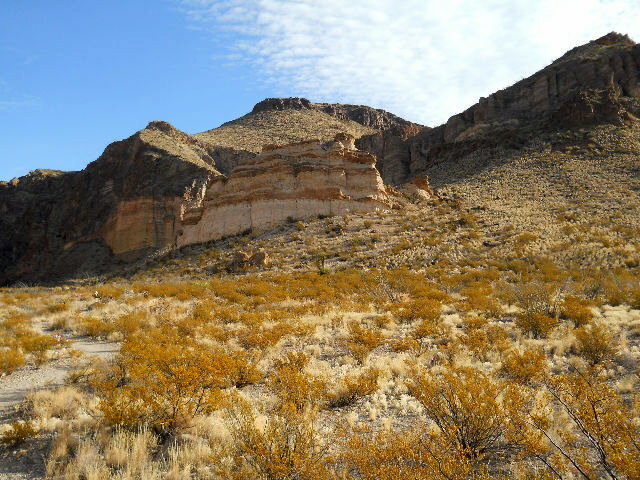 We stopped at Burro Mesa Pouroff and took some photos of the colorful cliffs. 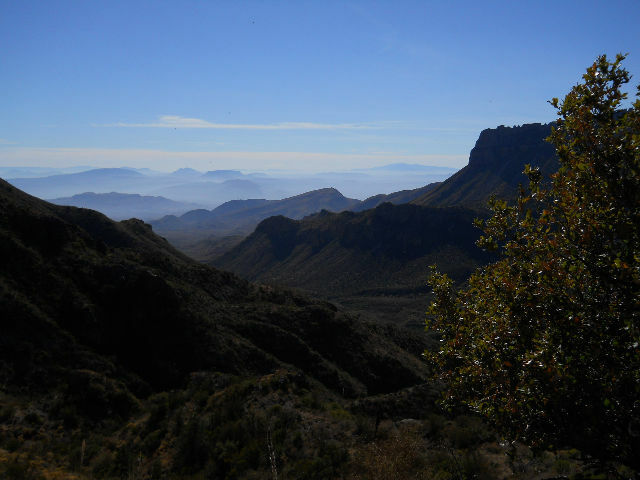 We stopped at Sotol Vista and got what is said to be one of the best views in the park. We then stopped and hiked the Homer Wilson Ranch trail to the ranch house and back. We saw many interesting birds here along this trail - some we could actually identify. We ate lunch in the trailer in the parking lot. 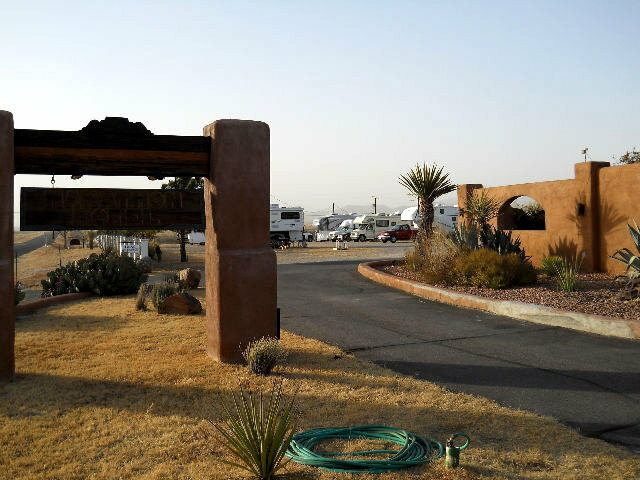 Then we drove on over to Rio Grande Village Campground where we set up in site #61. < Burro Mesa Pouroff. 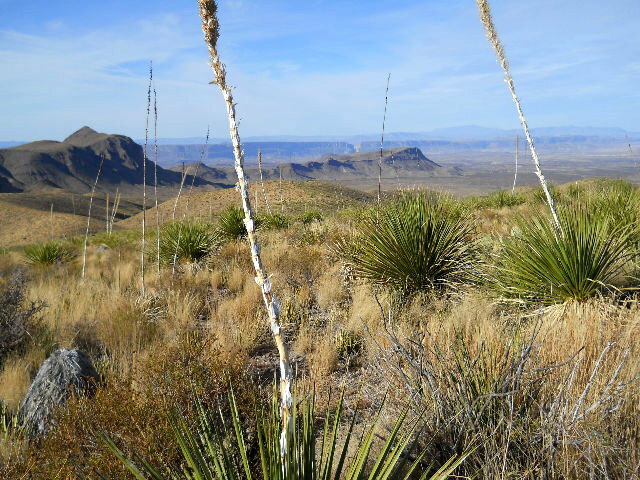 < Sotol Vista. 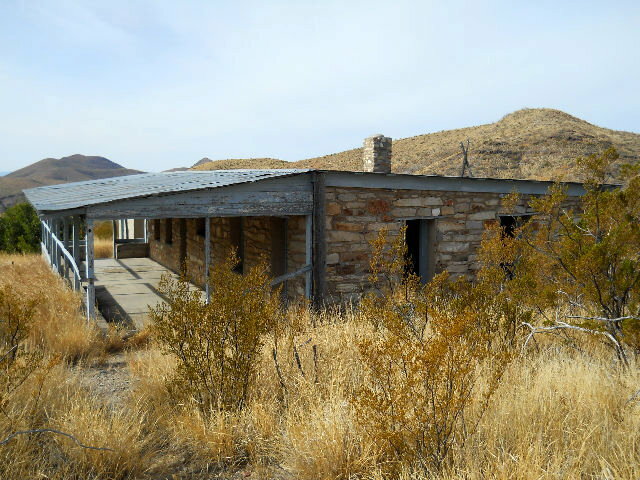 < Foreman's house abandoned in 1945. < Homer Wilson Ranch Trail. 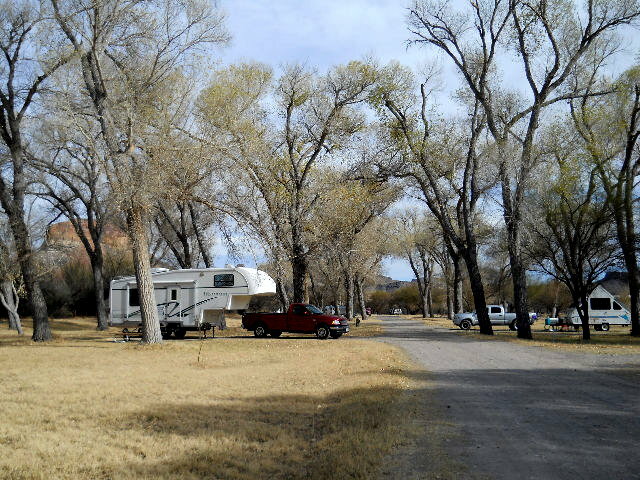 < Rio Grande Village Campground. [Monday] In the morning at 10:30 am, a Resource Assistant presented a program at the Amphitheater entitled "In the Age of Modern Dinosaurs". The premise was that birds are modern day dinosaurs. OK. Afterwards we took advantage of the open Wi-Fi at the store and collected email and made some phone calls using our magicJack. 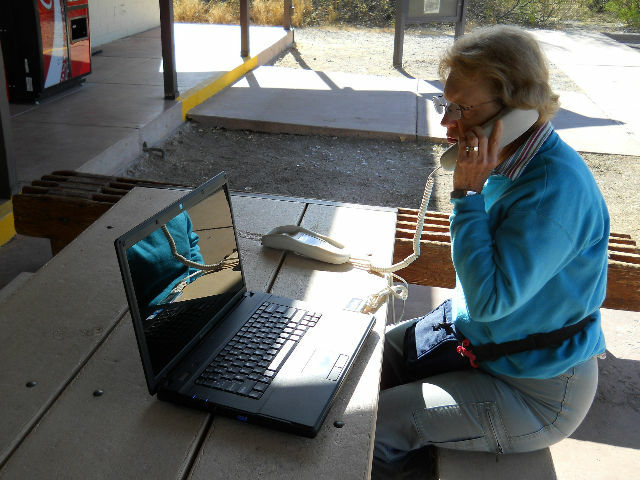 < Kay uses magicJack to call home. 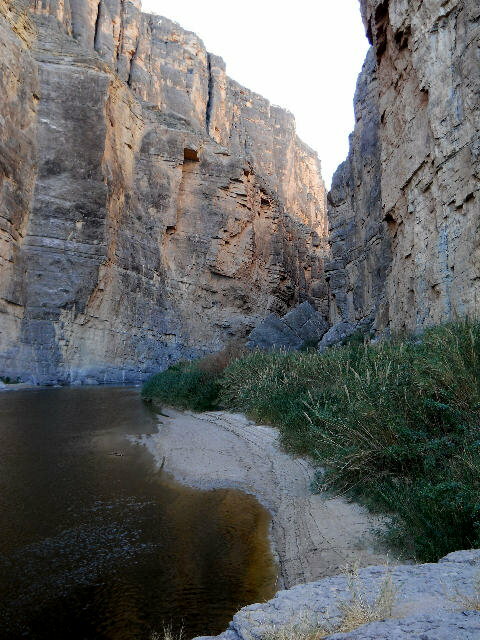 In the afternoon we drove 4 miles down to Boquillas Canyon and hiked along the river to near the end of the canyon. 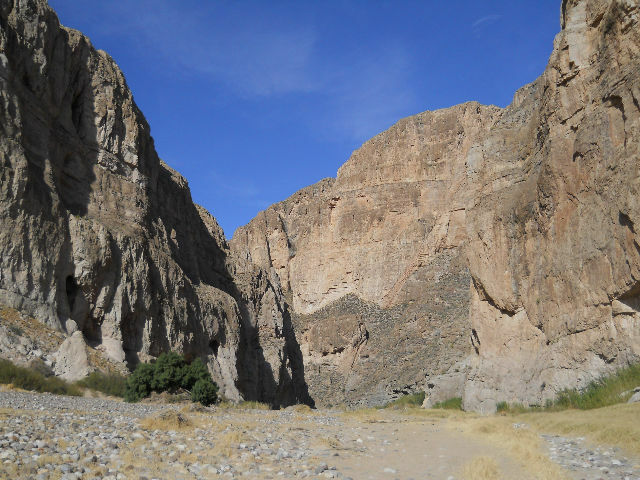 The only reason this canyon is not as impressive as Santa Elena is because you can't hike very far into it due to the steepness of the sides. The Mexicans had illegally crossed the river at various spots and laid out their items for sale on the rocks. They must be doing a good business because they have lots of spots with items for sale, even though it is now illeagal for U.S. Citizens to buy or possess these items. We got introduced to "Victor" who was just across the river sitting on some rocks. He would sing for you at your request. His companion was on the U.S. side of the river but kept a safe distance from visitors. 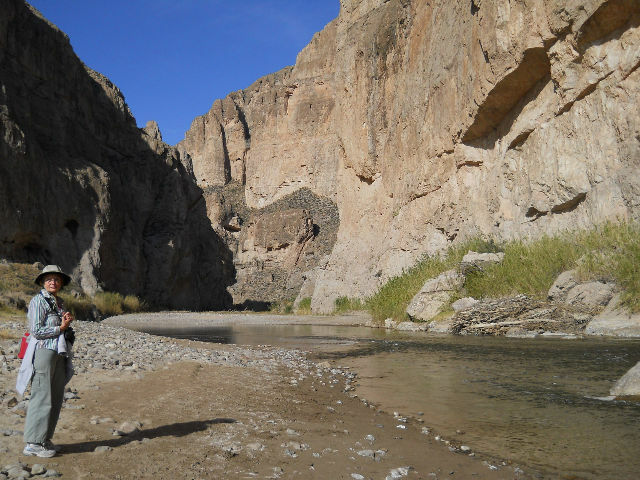 Even though the park is patrolled extensively by Border Patrol, they seem to leave these folks alone as harmless residents of the isolated Boquillas Del Carmen community across the river. After supper we drove about a half mile to the Rio Grande Village Visitor Center to join a Ranger for the "Starlight, Starbright" program. It was a perfect night for looking at the stars, and the perfect location. They said that with the unaided eye you can see 2,000 stars - believe them. There was no moon and you could easily see the Milky Way and many other stars, galaxies and constellations as the ranger pointed them out. We even got to see a rare observation of a light called the Zodiacal Light. 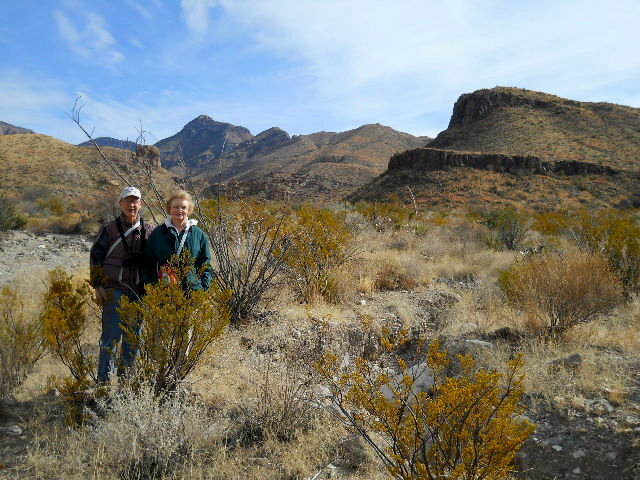 [Tuesday] In the morning we drove about 30 miles up to the Chisos Basin to the Lost Mine Trailhead (5600 ft.) to join a Ranger for a 10 am guided walk entitled "Experiencing Natures Quilt". It was a 2-hour casual walk up the trail to a rock formation called the saddle. 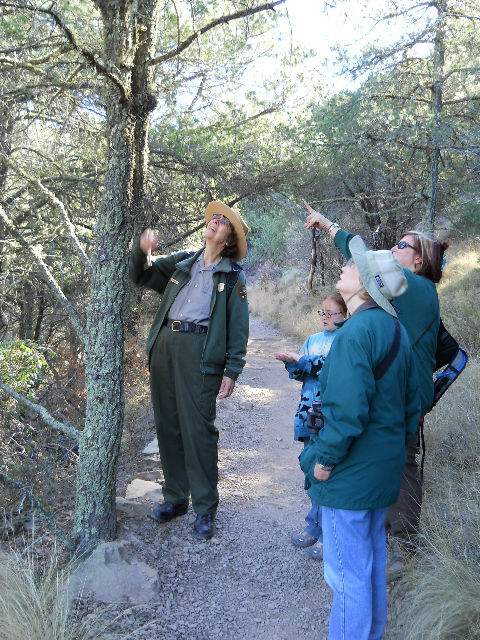 We were educated by her pointing out all the natural plant and animal life that most people overlook as they hike the trail. < Our guide explains. < View from the saddle. < Kay & Lawson with Casa Grande in the background. 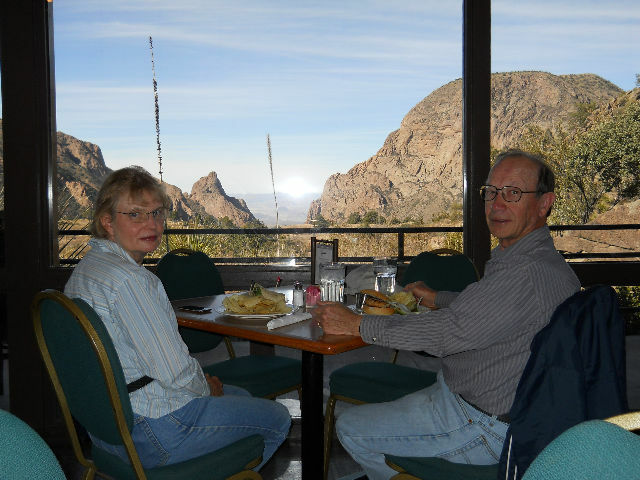 Afterwards, we enjoyed a scenic lunch at the Chisos Basin Lodge. The view of the "Window" from the restaurant is quite a treat to go along with a very good lunch. 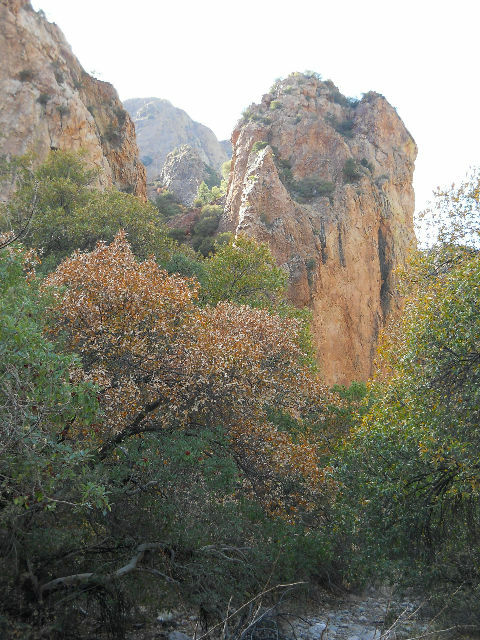 After lunch we hiked the Window Trail that descends through Oak Creek Canyon to near the top of the Window pour-off. It was all downhill going and all uphill coming back. It was very scenic and well worth the effort. < Are there really lions & bears here? Yes! < < Window Trail views. < Sunset through the Window. We then treated ourselves to a double scoop of ice cream and cup of coffee at the Basin Lodge and walked the Window View Trail to watch the beautiful sunset. Then came the 30 mile drive back to Rio Grande Village Campground. We arrived back in the campground about 7:20 pm. [Wednesday] In the morning we drove about 15 miles to a site called Dugout Wells, where we attended a presentation by a Park research assistant on "The Desert Apothecary". 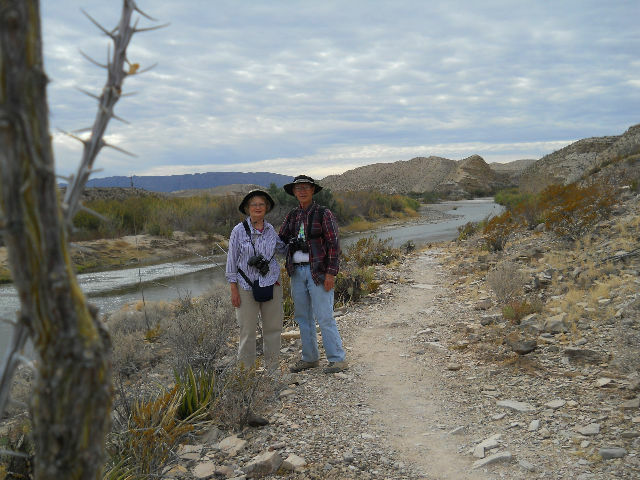 We took a short walk with the guide along the Chihuahuan Desert Nature Trail. 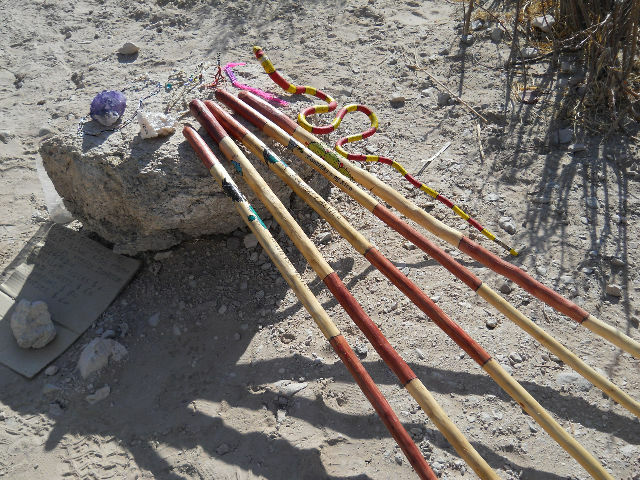 She said that it was even easier for native people to die in the Big Bend area a thousand years ago than it is today. But, fortunately they knew how to use 80% of the plants here as a resource. She enlightened us on some of them. 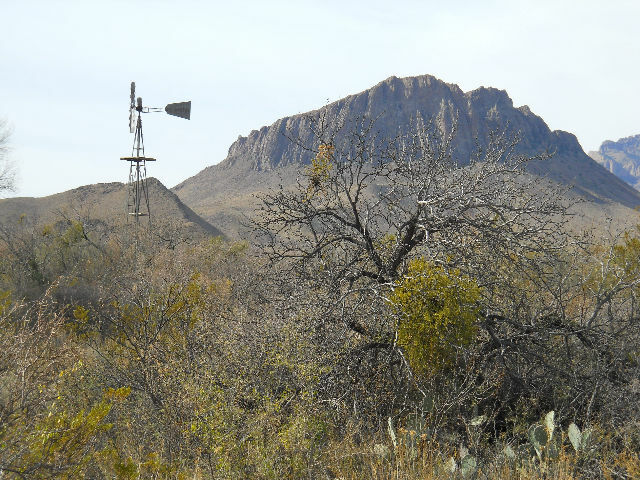 The area is highlighted by a shady oasis of cottonwood trees which are receiving water from a working windmill. < Nature Trail. < The Desert Apothecary. In the afternoon the chores of living caught up with us and we had to go to the store and wash clothes in the laundry, which was a quite popular place with the campers. We availed ourselves of the open Wi-Fi again to check email and make phone calls using magicJack. [Thursday] We left the campground at 10 am to go to the Rio Grande Visitor Center on our way to a ranger program at 11 am at Hot Springs. 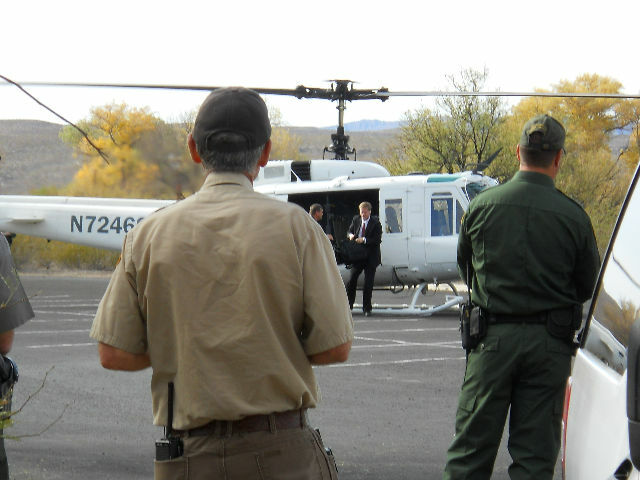 As we got to the Center, the parking lot was blocked off and about 20 or more Border Patrol, Park Ranger and other vehicles, including a fire truck were on the road. We stopped and asked what was going on and someone said that a helicopter was going to land in the parking lot. The Visitor Center was still open so we went inside and the volunteers there told us that the #2 man in Homeland Security was going to arrive shortly for a meeting on the possibility of creating a International Park here in Big Bend with Mexico to have a limited opening of the border here. This could possibly happen in 2012, if things work out. We stayed to watch the helicopter arrive and the big wheel arrive. He really looked out-of-place there as the only one in the wilderness with a suit, white shirt, tie and briefcase. 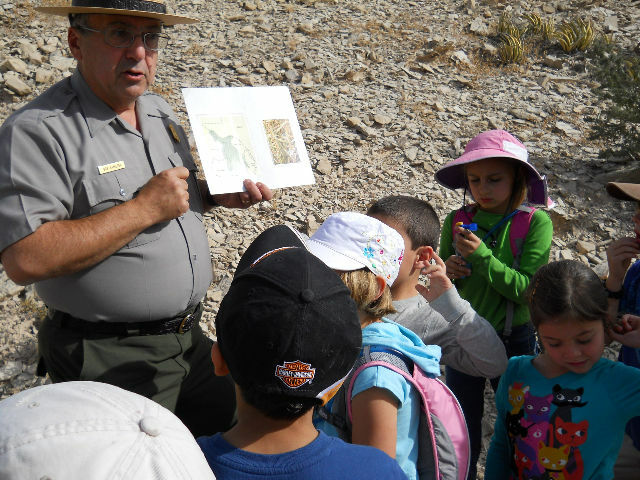 After the excitement, we drove on to Hot Springs to attend a presentation by a Park Ranger on "Making a Dollar". 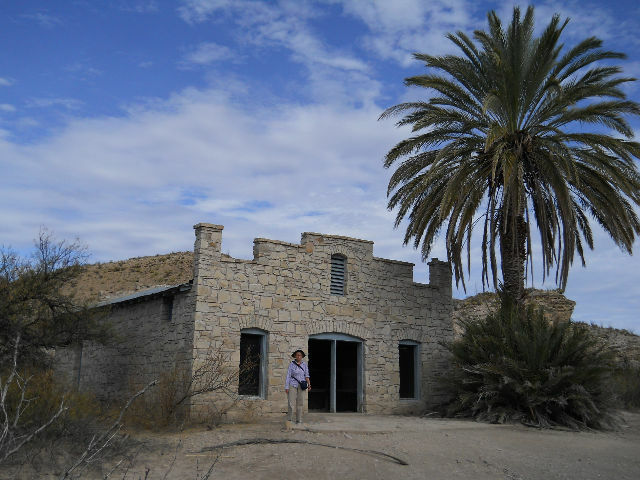 In historic Big Bend, ranching and mining were the main legal ways of making a living. 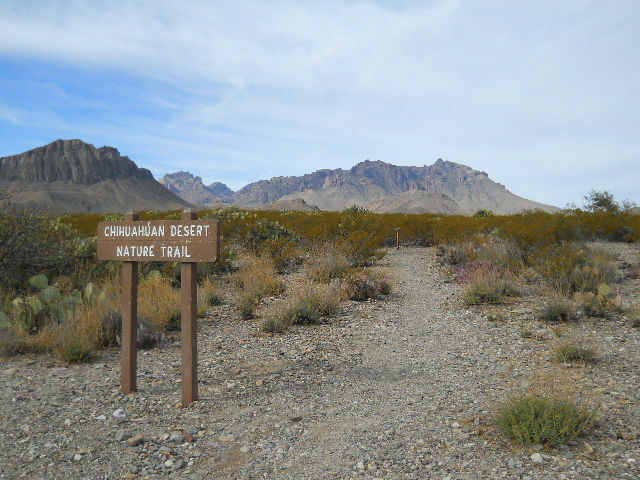 Another industry, endemic to the Chihuahuan desert, also existed alongside these more mainstream endeavors. 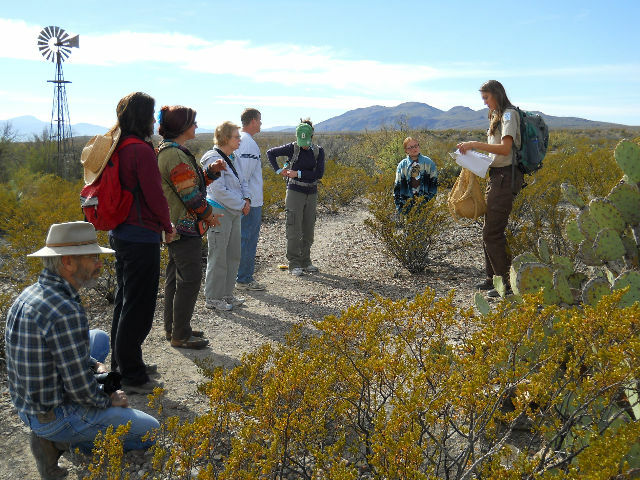 He told us the story of candelilla wax production in the Big Bend, made possible by the abundance of candelilla plants in the area in the early 1900's. < Ranger presentation to local school kids. After the presentation, we ate our picnic lunch next to the Rio Grande under a great big palm tree(s). We examined the old general store and motel courts that flourished in the 1930's & 1940's when the hot springs were developed into a tourist attraction for it's supposedly healing waters. We hiked along the river to the springs, which still produce 105-degree water. 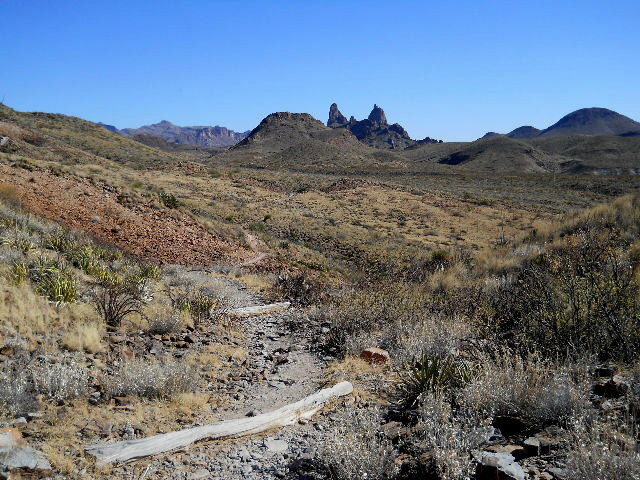 We continued beyond to where the loop trail and the Rio Grande Village Trails part. We saw more Mexicans on the other side with their horses as they watched across the river where they had their trinkets for sale next to the springs. 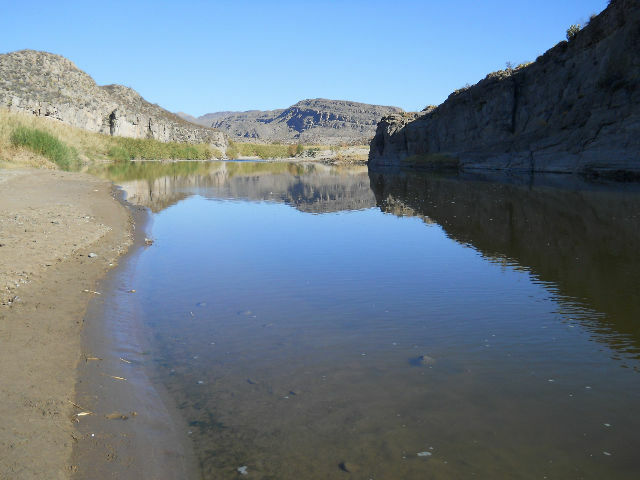 We saw a kiaker going down the Rio Grande toward the Village. < Old store. 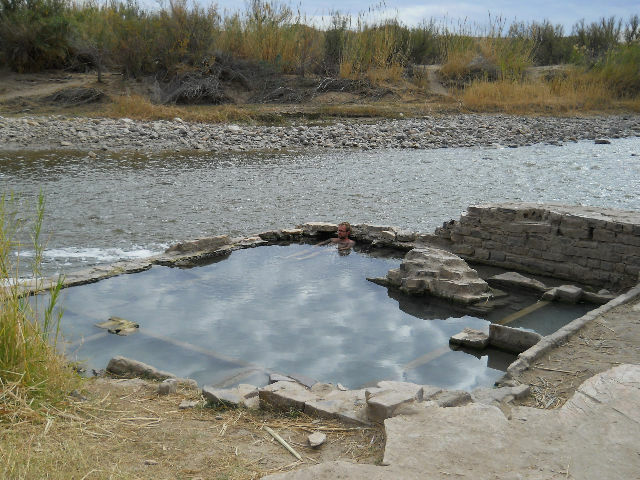 < The remains of the hot springs. < Lawson & Kay on the Hot Springs Canyon Trail. On the way back to the campground, we stopped at the Visitor Center again and viewed a video on birding techniques. [Friday] We had to get up early this morning to drive about a mile to Daniels Ranch to attend a field trip with a Park Ranger to do some birding. His programs was entitled, "The Best Bird?". It's the one in your binoculars! He pointed out some of the resident birds and gave us some good instruction on techniques of identifying birds. It was instructional and he was entertaining. 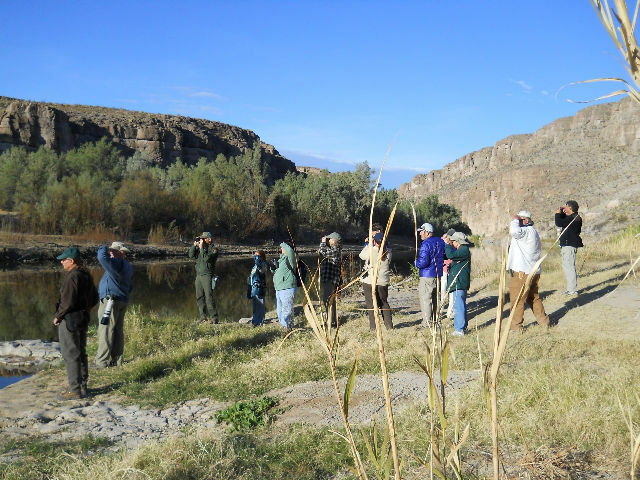 < Birding near the Rio Grande. After lunch back at the trailer, we drove about 6 miles up the Old Ore Primitive Road (rough, rocky, steep, dusty) to a camping area named Ernst Tinaja. 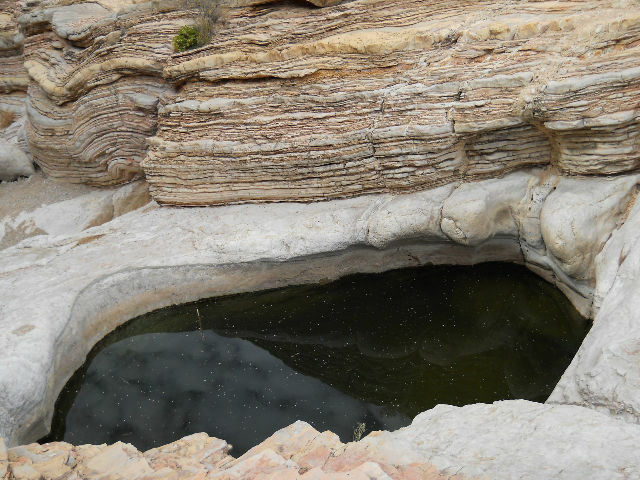 Ernst is the name of a settler in the area and tinaja is Spanish for a small pool of water in a rocky hollow. We hiked an approximate 2 miles up a dry wash to the tinaja. We enjoyed the snacks and water we brought before heading back down. < The Old Ore Road. < On the way to the tinaja. < Ernst Tinaja. After supper, we walked over to the Amphitheater and attended a very entertaining presentation by a Park Ranger at 7:30 pm entitled "Rolling on the River". 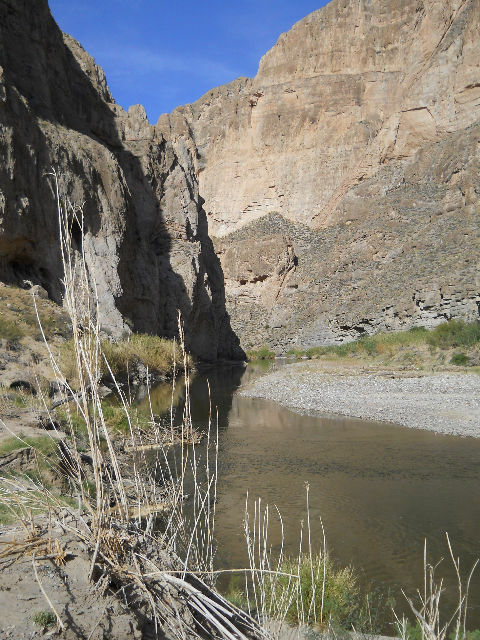 He highlighted the history of the Rio Grande River and the many changes that it has seen in just the last 100 years. [Saturday] Well, this is our day to depart from the park, but we still have a full day of activities before we say goodbye. After breakfast we went down to the end of the campground and walked along the Rio Grande Village Nature Trail. This trail passes through a beaver pond and on to the river. 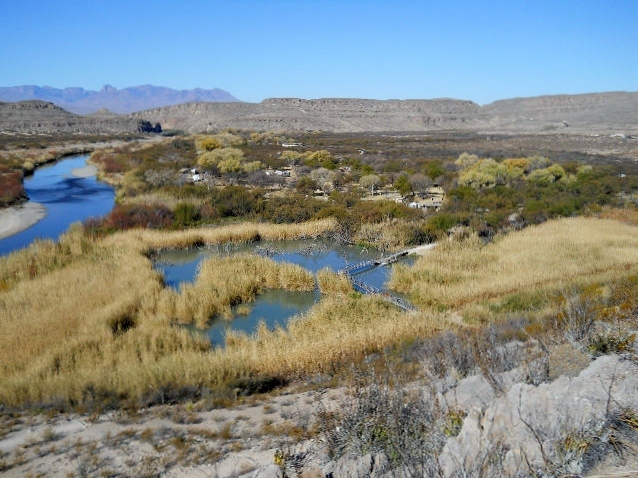 Then up to the top of a hill where there is a good view of the campground, river and the Mexican village of Boquillas. < Overlooking the campground and beaver pond. < Rio Grande at the campground. We pulled up camp at Rio Grande Village after our walk and after dumping our tanks. 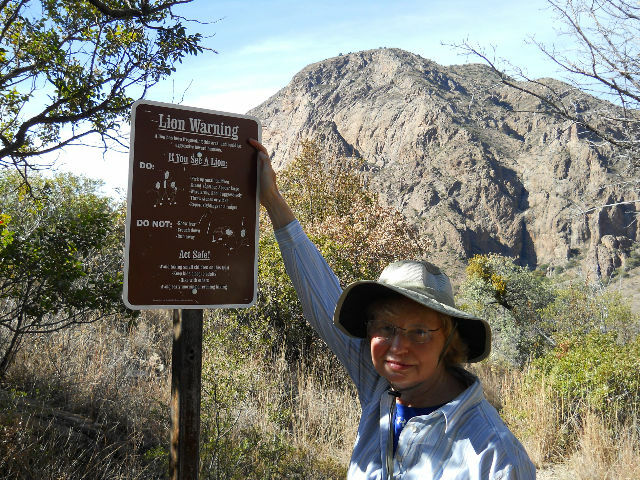 We drove up past Panther Junction to a parking area off the road to the Chisos Basin. We dropped our trailer off and after lunch, we drove north 6 miles on the Grapevine Hills Road until we got to the Grapevine Hills Trailhead. 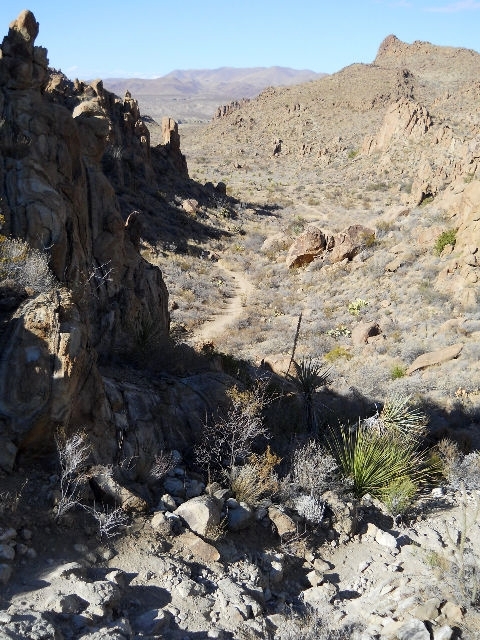 We hiked the trail through a sandy wash and massive granite-like boulders to a low pass at the south end of the drainage. At the end you climb up a steep 100-yard trail to find a picturesque "window" of boulders known as Balanced Rocks. < Looking at the trail from above. 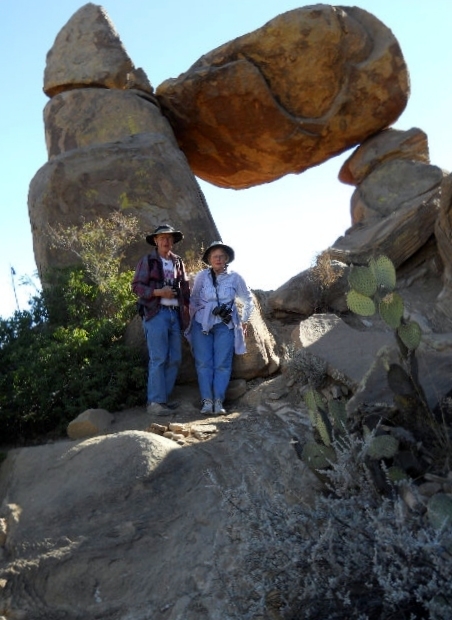 < Lawson & Kay at Balanced Rock. 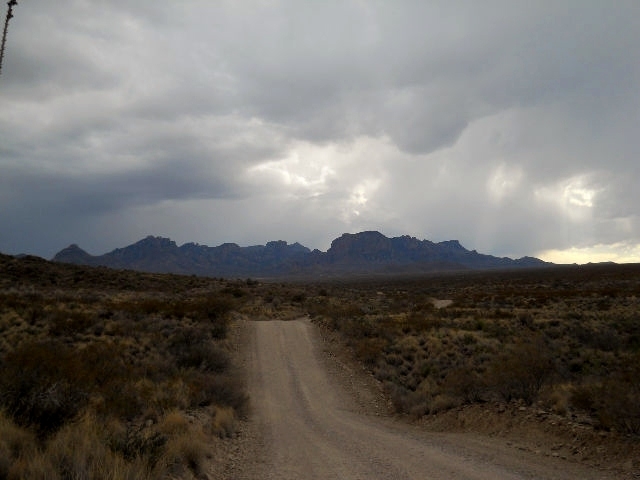 As we drove back down Grapevine Hills Road, we saw the rain clouds gathering over the Chisos Basin. A few drops of rain fell as we hooked up the trailer and left, heading back up US-385 to Marithon. The clouds were more prevalent as we continued up the road. 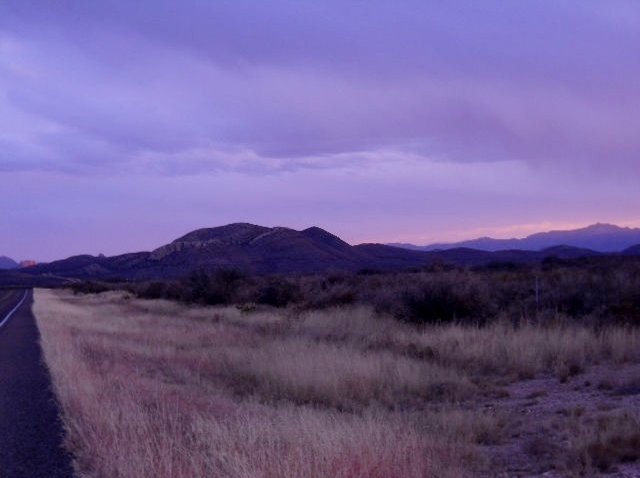 As we parted the park, it was near sundown and as an appropriate ending we saw the colorful sunset over the mountains. This was the first rain in the park since September. < Storms gather over the Chisis Basin. 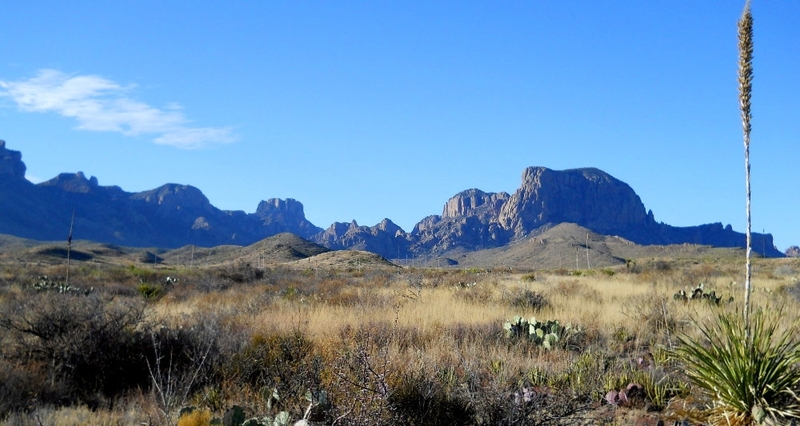 < Goodbye Big Bend! [Sunday] We left Marithon on US-90 East after breakfast. Fortunately we had a tailwind this time from the southwest, so we sailed down the road through this wilderness without any trouble. We stopped in Del Rio to gas up at Walmart, with our final stop for the day in Castroville at the Castroville Regional Park. We stayed here a few months ago when we were on our Hill Country trip and enjoyed the park. It's a good place to stop. [Monday] We left Castroville in the morning, continuing on US-90 until we reached San Antonio. There we picked up IH-10 East toward Houston. We stopped for lunch on the side of the road around Flatonia and arrived back home in mid-afternoon. 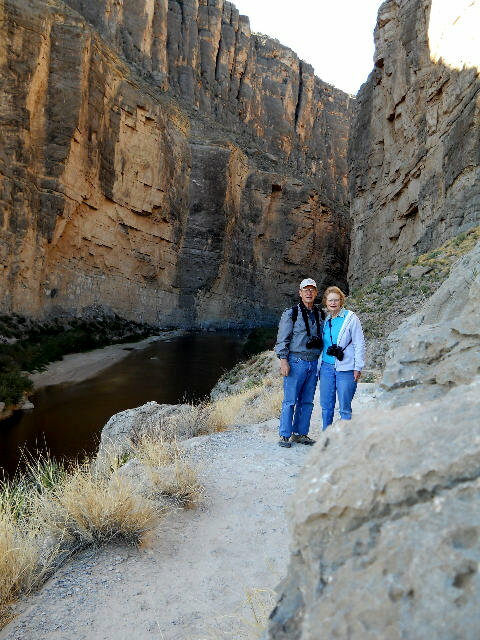 This draws to a close our visit to the Big Bend National Park area of Texas. We hope you enjoyed the photos and brief descriptions of our activities. God willing, join us again soon for another RV adventure.